In January 1927, Agnes Conway, an archaeologist, writer, traveller, curator and historian, set out for the Middle East. She went via Venice, Athens and Cairo, taking the Palestine Railways across Sinai from El Kantara (East) on the Suez Canal, to Jerusalem – a popular route in the inter-war period. Travelling by car, she crossed the Jordan river and reached Amman, in what was then British Mandate Transjordan, in late February 1927. Unexpectedly, she was able to arrange trip to Petra, travelling there on a Thomas Cook & Co. tour package. 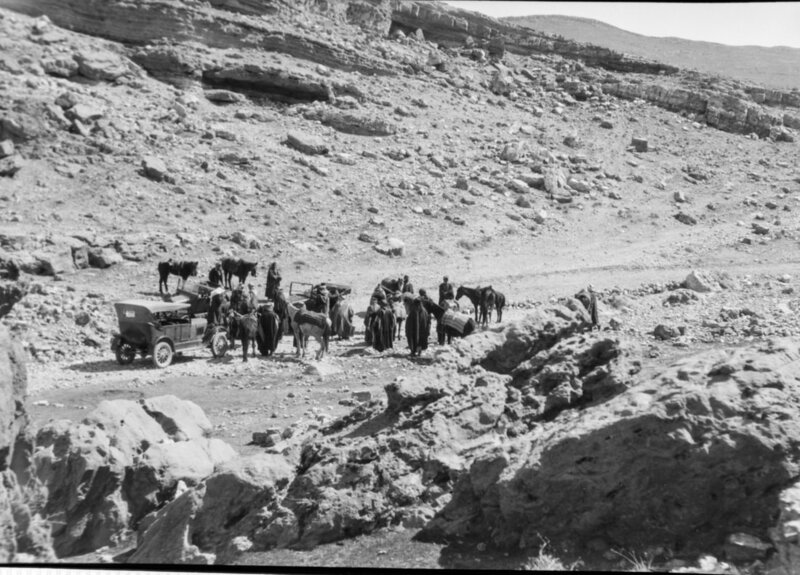 Starting out for Petra in Wadi Musa, 1927. Copyright UCL Institute of Archaeology. Taking the train from Amman to Ma'an, in the south of Transjordan (an all day journey), she alighted at Ma'an station, the end of the Hejaz Railway. Ma'an was a bustling hub, headquarters of the southernmost administrative district of Transjordan with a comfortable "Hotel Petra" and a nearby Royal Air Force (RAF) outpost. After spending night there she and her fellow tourists were driven to Wadi Musa, and climbed on horses to finish the journey, riding past the small village of Elji, on the outskirts of Petra district. Then, along the Bab es Siq and into the narrowing passage of the Siq, opening out, eventually, to the splendour of El Khasneh - the Treasury - and the tombs and facades of the ancient city. Agnes stayed at Petra for three days. Cooks' had a well provisioned camp inside Petra, by Qasr el Bint Faroun, enabling tourists to stay in caves or tents. Servants were on hand to cater to any needs. Cooks' dragomen and local Bedouins (who carried with weapons, for safety) facilitated tourist access to the site, helping where necessary to haul people up the steep stone wadi edges to areas and tombs high above the wadi beds. She left the site fascinated by its light and colours, its ancient ritualistic sites, its mystery. 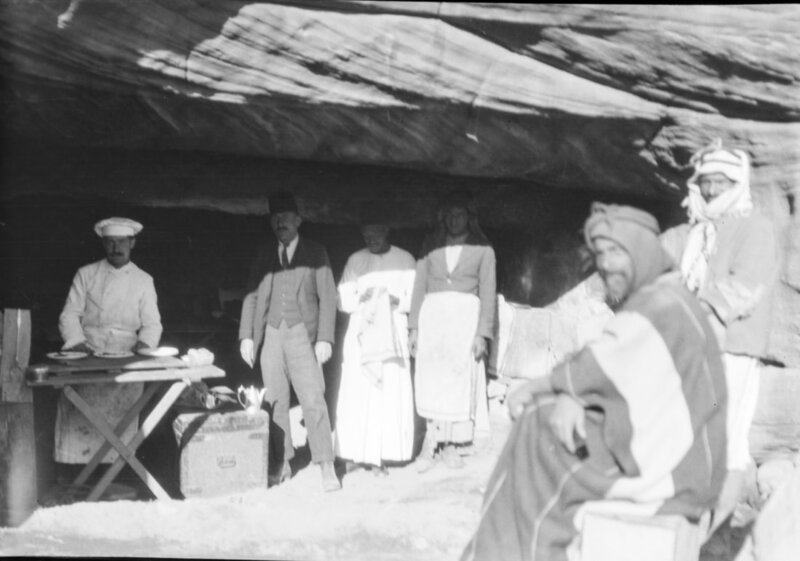 Group in kitchen inside a cave at Cook's Camp, Petra; photograph taken during Agnes Conway's trip in 1927. Copyright UCL Institute of Archaeology. On her return to London in the summer of 1927, alongside her other projects and a hectic social life she began reading as much as she could about Petra, forming her own theories on its significance. She started with a recent survey of the site, published by Country Life in 1925. It was the work of engineer and UCL Professor Sir Alexander Kennedy,who had surveyed Petra with the permission of Emir Abdullah (courtesy of then British Resident Harry St John Philby). Despite its hefty price (£4 4s) it was considered to be a book that brought previous rather inaccessible scholarship (mainly in German), to a wider audience with the added inducement of over 200 photographs of the site. His sketch map of Petra, created using aerial survey techniques and the assistance of officers in the R. A. F.'s 14th Squadron (all of whom, he noted "took the keenest personal interest in the work") was a significant and valuable resource for the Petra expedition of 1929. By 1928, as Agnes continued her research in the Reading Room of the British Museum, she considered writing a guide to the site. She devoured books by all those associated with the interpretation of Petra – Gustav Dalman, Peres Antonin Jaussen and Raphael Savignac of the Ecole Biblique in Jerusalem, Ditlef Nielsen, Arthur Samuel Peake, Daniel Chwolson. She borrowed maps of the site from the Royal Geographical Society to help her solidify her theories. In July, she interviewed Sir Alexander Kennedy and went over his personal collection of photographs, and she discussed the relevance of astrology to Petra with Friedrich Saxl, an art historian at the Warburg Institute in Germany. In August 1928, there was a new development - the result of a meeting at the 17th International Orientalist Congress in Oxford. George Horsfield, the Chief Inspector and top British official in the Transjordan Department of Antiquities, was in England to give a presentation about archaeology in Transjordan at the Congress. Horsfield was a guest at the Conway home in the days leading up to the Congress, and then he and Agnes headed to Oxford. The Orientalist Congress was a major academic networking opportunity for both George and Agnes. First begun in 1873, it had been held in 16 cities since, roughly every two to three years. Delegates from all over the world descended upon Oxford for the first time since the outbreak of war in 1914. The Congress had nine different sections: a general section and others covering different geographical regions and chronological periods. Each section had its own President. George was there to represent "Transjordania", listed alongside others from India, Cyprus, Ceylon (Sri Lanka), Palestine and the Straits Settlements as part of the "British Empire". In the "General" Section, on 28 August, he lectured on "The Archaeological Service in Trans-Jordan and its Works", outlining the history of the Department of Antiquities in Transjordan and the work being done primarily at Jerash and Amman. He also reported that "villages were allowed to assist in removing useless stones, under license, for their own use", an activity which "had almost completely checked illicit looting." Agnes and George attended various papers over the course of the conference, but on 30 August, there was, in Agnes's eyes at least, a fateful meeting with Dr Ditlef Nielsen, attached to the University of Copenhagen. Horsfield invited Nielsen to take part in an excavation at Petra, with Conway as part of a team. Horsfield had, with this invitation, given her the opportunity to return to Petra to conduct her personal research on Petra religion under the aegis of government sanctioned work. Nielsen had his own interests in Petra. Later that evening as part of the "Old Testament: Hebrew and Aramaic" Section he presented his paper "Where is, and What Was, Mt Sinai?" outlining his theory that Petra was the Mount Sinai of the Bible, where Moses was given the Ten Commandments. On Nielsen's suggestion, Dr Tawfiq Canaan, a Palestinian physician with a keen interest in customs and folklore, was invited to take part in the plan as well because of his expertise on local religious sites and ability to engage with local communities. Within a few weeks Agnes had found a financial backer for the excavation in the form of Henry Mond, a wealthy industrialist and politician from a family with a well-established interest in funding archaeology. Henry Mond's uncle Robert Mond helped to finance archaeological expeditions in Egypt and Palestine and was a major donor to the British School in Jerusalem, while his grandfather Ludwig Mond had helped to finance University of Liverpool excavations before the war. In the months leading up to the beginning of the excavation, Agnes embarked on courses of skills training. She began taking lessons in Arabic at the School of Oriental Studies in Finsbury Circus (now the School of Oriental and African Studies). One of her tutors there was Sheikh Kadim Dojaily with whom she learned colloquial Arabic. Originally from Baghdad, Dojaily was Lecturer in Arabic, and also a poet and former diplomat. She also took lessons from Edward Reeves, head of the Map Room at the Royal Geographical Society, in surveying. Agnes departed England for Petra at the end of February, 1929. She travelled again through France, taking a boat from Marseilles to Port Said, and from there to Jerusalem. George Horsfield was there to meet her, and in Jerusalem they met Tawfiq Canaan, who advised them on medical supplies and contributed to project plans. There was a flurry of shopping and preparations in Jerusalem in advance of the departure for Transjordan – in all, there were over 30 cases of supplies. A few days were spent in Amman making final preparations, and then on 20 March, the party boarded a train, bound for Ma'an. Agnes Conway's Diaries from 1927 and 1928. University of Cambridge Library. Kennedy, A. 1925. Petra: Its History and Monuments. London: Country Life. Lumby, C. 1934. Cook's Traveller's Handbook to Palestine, Syria & 'Iraq. London: Simpkin Marshall Ltd. Proceedings of the Seventeenth International Congress of Orientalists Oxford, 1928. Oxford University Press. Thornton, A. 2013. “… a certain faculty for extricating cash”: Collective Sponsorship in late 19th and early 20th century archaeology. Present Pasts.